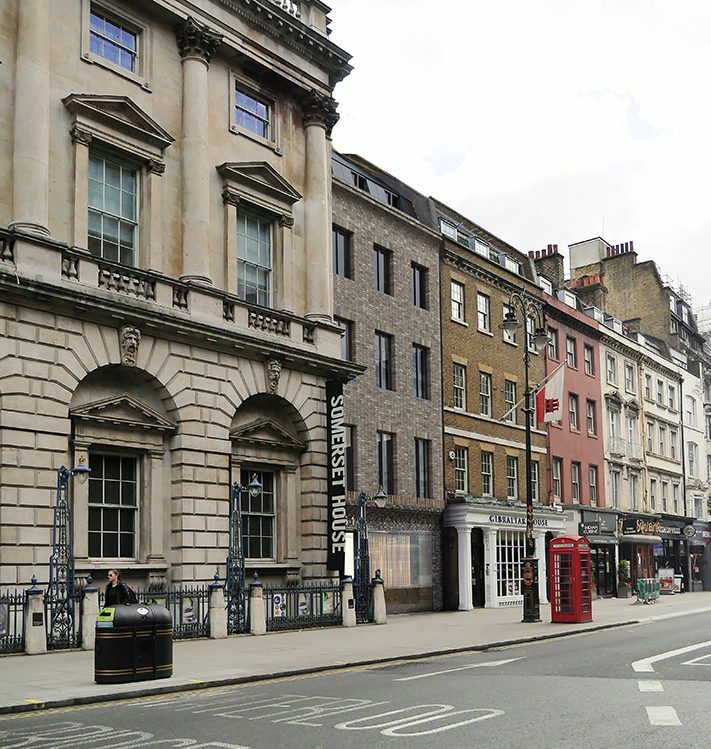 The Franklin family, who has had a commercial presence on The Strand since 1946, have hired us to design Franklin House, a new boutique-style art hotel and members’ bar at 151 Strand. 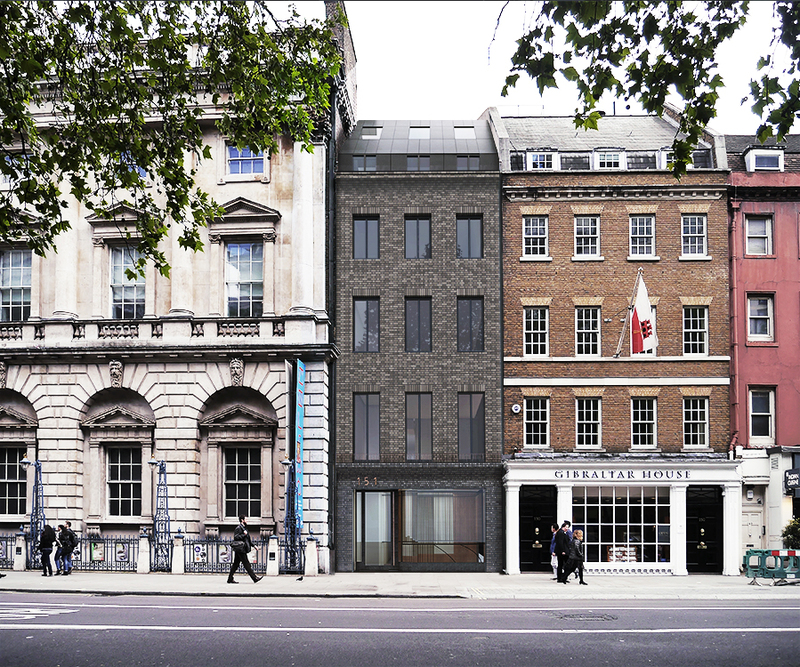 Situated next to Somerset House, the luxurious boutique hotel concept, which has received planning permission from the City of Westminster, will consist of five residential/serviced suites with sumptuous interiors. The building continues a long history of hotels on the Strand, including, most famously, the Savoy opened in 1889, and later the Strand Palace hotel. 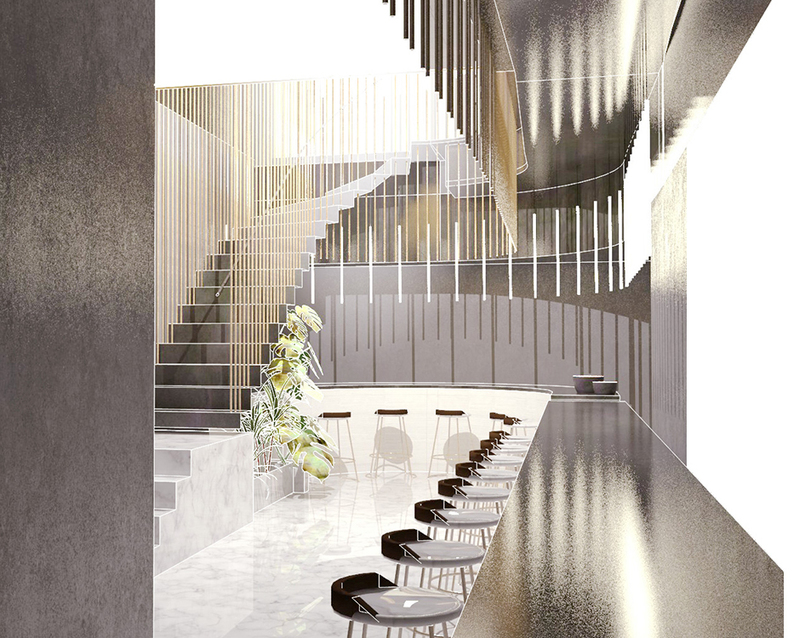 Guests will arrive at street level to a welcoming a reception area and dramatic hanging staircase, which curves down to the members-only bar at the basement level below. A lift ascends to access the self-contained one and two bedroom apartments above, each designed and furnished with antiques, vintage collectibles and extraordinary objects. 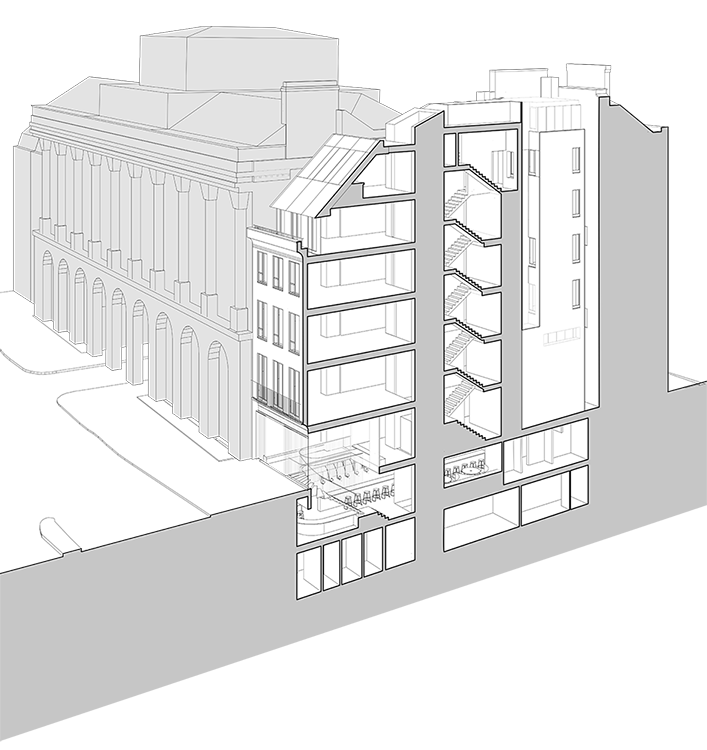 The programme of the building includes a bar at the lower ground floor, the entrance at street level and above, five apartment hotel suites with living spaces at first to fifth floor. The new staircase is placed at the rear of the plan to allow larger rooms to the front with a wider rear extension to make more accessible bedrooms. 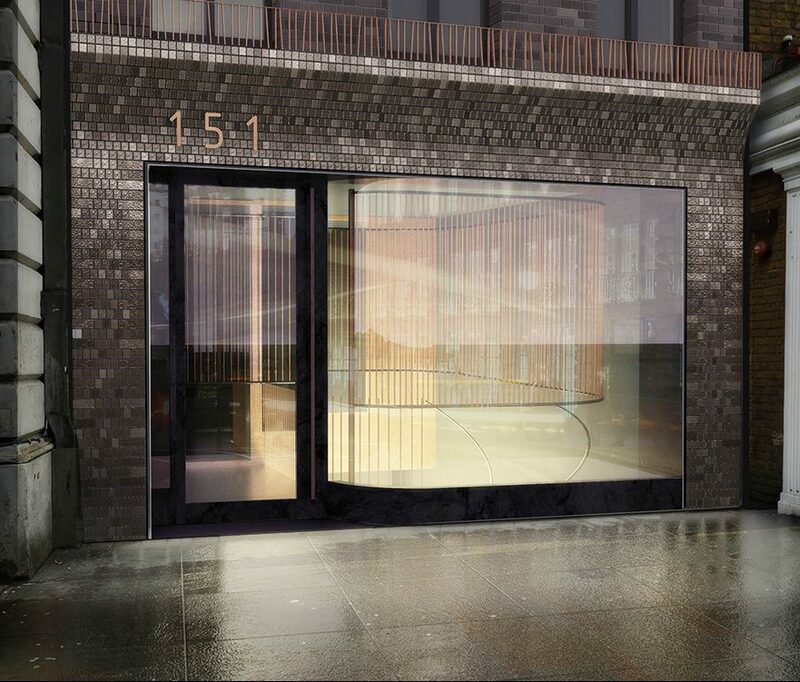 The key aim for the proposals is to express 151 as part of the background terrace, using appropriate contrasting materials in a similar way to the adjoining terrace at the east end of Somerset House. The previous building used to blend in with Somerset House, diluting the prestigious building. 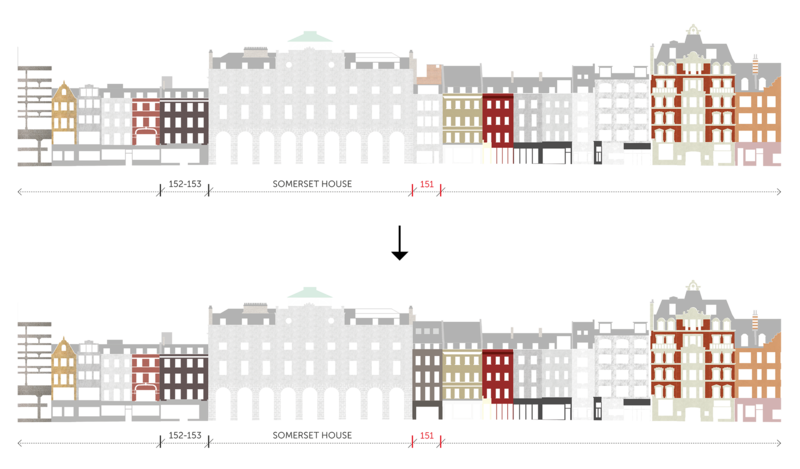 Importantly, the new scheme differentiates itself, emphasising the beautiful proportions and clarity of Somerset House. The threshold to the street is an inviting and transparent element of the design, which includes a dramatic double-height space with a stair to the bar below. The threshold space provides a transitional experience for the guest from the busy street to the interior of the hotel. The view down to the lower ground floor references the entrance to Romano’s bar, formerly on the Strand. It also references the historic deep light-wells formed around the edge of Somerset House as a result of the embanking from the Thames.